Do you want to have 4 gallon air compressor that is guaranteed to deliver high performance? Your wish is Husky command. Husky 4 Gal. 225 psi High Performance Crew Electric Portable Air Compressor is perfect for the Trim Crew and even up to the 3 man Framing Crew. With its 4-gallon 225 psi tank capacity, it can definitely serve as a reservoir for more usable air than the 4-gallon 125 psi model. In fact, the former can accommodate three times more than the latter. 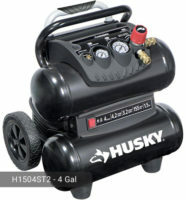 Because it can hold more air, the Husky C041H model is also better in terms of performance. It can run up to 5 finish nailers and up to 3 framing nailers. The tank also has a ¼ turn ball valve for easy draining. This feature is not available in other models. The pump also contributes to the greatness of this machine. 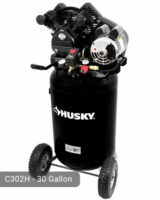 This Husky 4 gallon air compressor can deliver 5.1 SCFM which is also better than other models. It also recharges faster (25% more) which assists in the fast delivery of the task. With this pump, the following tasks can be easily performed: blow cleaning, air brushing, grinding, surface preparations, cutting, drilling, and many more. It can power various hand-held tools such as plasma cutters, sprinkler systems, and limited spray gun. These tools can be simultaneously run. This model is very portable. 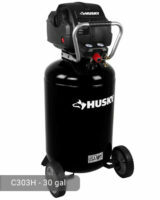 It is lighter than most air compressors with the same tank capacity, weighing only 55 lbs. The three handles on top will give you a good grip of the machine. The tank has a horizontal orientation which makes it very compact. It is not as slim though as the other models that have tanks which are vertically oriented. You can store the machine easily because of its small size and a cord wrap that comes with the package. It also operates quietly which is very convenient for home owners. The four rubber feet allow the machine to stand on its own and lessen the vibration during heavy-duty operations. All of the materials used for the tank and other parts are very durable. For added protection, the air compressor has a roll cage and control panel. These features ensure that the vital components of the air compressor are well-protected from external sources of damage. The pump is oil-free so there is no need for additional maintenance activities. To start running the machine, you would need a 120-volt electrical power source. The power cord of this air compressor is 6 feet long and is as thick as your fingers. It is very easy to use and can be manipulated by all adults in the household. Husky 4 Gal. 225 psi High Performance Crew Electric Portable Air Compressor indeed works like a pro! 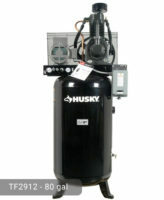 Compared to other models, this air compressor has features that are far better than others. At a very affordable cost, you can purchase a machine that will assist you in your daily projects. You will never regret trying this one out. 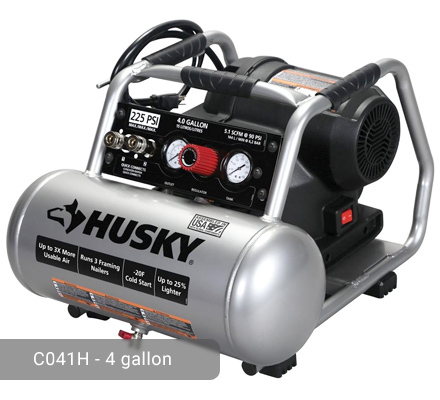 If you already own Husky C041H model or just want to buy it, feel free to share your review or ask a question through the form below. Where can I get a new pressure regulator for the c041h compressor four gallon? 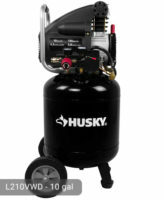 Husky 4 Gallon Air Compressor, C041H – 225 PSI, High Performance. Where is the User Manual link to download ?